At CES 2018 in Las Vegas, LG will introduce upgraded models of its popular monitor lineup with Nano IPS technology that take color reproduction capabilities to a new level. 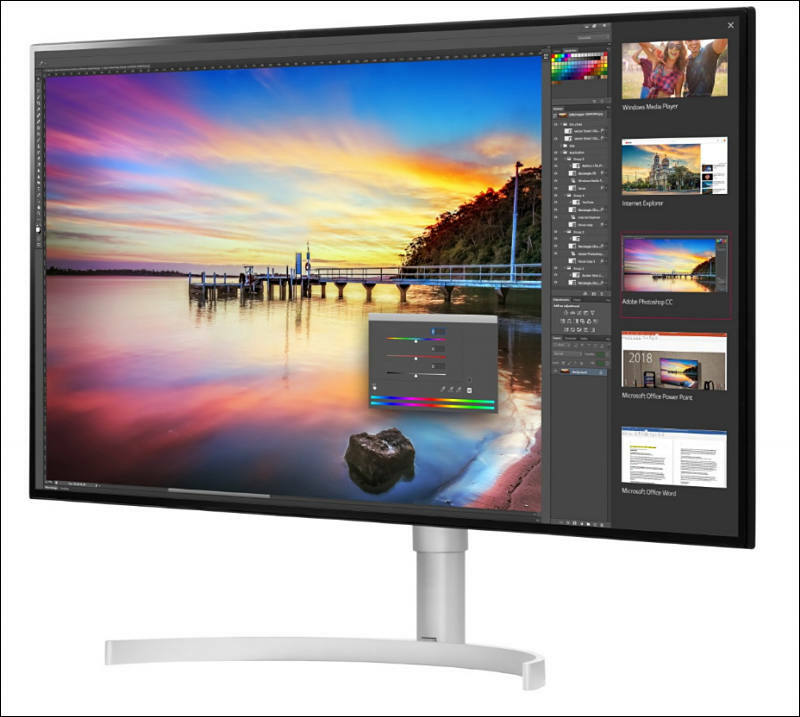 In response to customer feedback, LG added support for HDR600 with even higher dynamic range of peak brightness and new connectivity options with full Thunderbolt™ 3 compatibility. LG model 32UK950 features the first Thunderbolt™ 3 docking display to support 4K daisy chaining, allowing a set-up of dual 4K monitors. This LG monitor can connect to Thunderbolt™ 3 notebooks like Macbook Pro via a single active Thunderbolt™ 3 cable – no charging adapter or unsightly USB cables required. This monitor’s single Thunderbolt™ 3 cable transmits 4K content and sound while providing enough charge to power a 60W notebook, simplifying any work space. With its beautiful signature Edge-ArcLine Stand and stunning 4-Side Edge Borderless Design where the picture literally drops off the edge, there is no mistaking this LG monitor for anything else. Expected to be another hot item at this year’s CES, LG’s 34-inch UltraWide monitor (model 34WK95U) delivers a broad range of accurate colors and viewing angles at a surreal 5K resolution (5120 x 2160 pixels). LG’s very first 21:9 5K UltraWide monitor is loaded to the maximum with a hefty amount of screen real estate and eye-popping colors. This ultimate 5K viewing experience is geared towards users who multitask extensively, such as video editors, photographers and software and app developers. Model 34WK95U supports Nano IPS technology, fantastic color reproduction capabilities and HDR600. In addition, model 34WK95U features a Thunderbolt™ 3 port, which enables the transmission of 5K resolution images at 60Hz with a single cable. The Thunderbolt™ 3 interface is ideal for power laptop users who desire fast video, audio and data transfers without the need for a separate AC adapter. With its elegant, stunning profile, this LG monitor turns heads even when powered off, with its 4-Side Edge Borderless Design and gorgeous slim Edge-ArcLine Stand addition to its refined image. Another attention grabber from LG will be LG’s latest QHD gaming monitor (model 34GK950G), which offers premium picture quality with Nano IPS technology and high-speed G-Sync technology. All this and more can be experienced personally at LG’s booth (#11100) in Central Hall of the Las Vegas Convention Center during CES 2018.